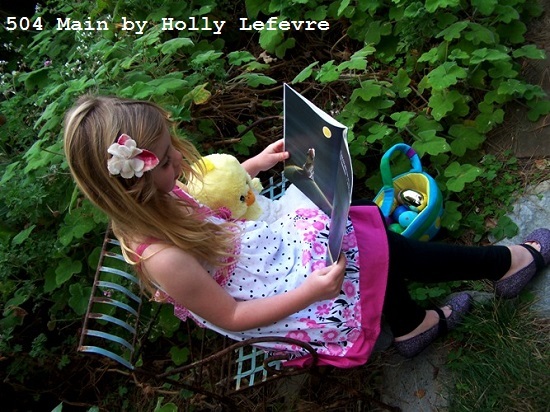 504 Main by Holly Lefevre: Spring Dress Shopping with My Girl! It must be genetics. I have always loved to shop. I have always loved fashion. I have always had my own style. by mixing and matching her shoes and socks, etc. I LOVE IT! She LOVES IT! And besides she is adorable, so how can she go wrong? and of course my girl needs some new dresses. (with motherly advice, persuasion, and the ultimate veto power, if necessary). and this shopping trip was no exception. Our Easter celebration is fairly casual. 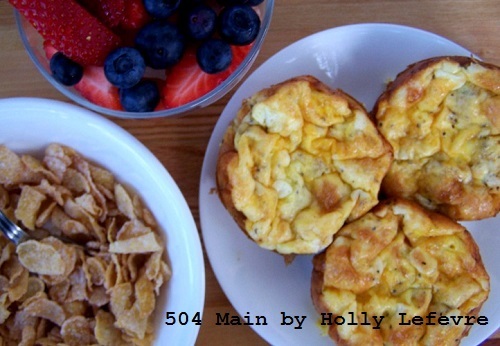 We just have a low-key brunch and egg hunt with friends. I like to have the kids look nice, and Jules especially likes to have a pretty new dress...or dresses! 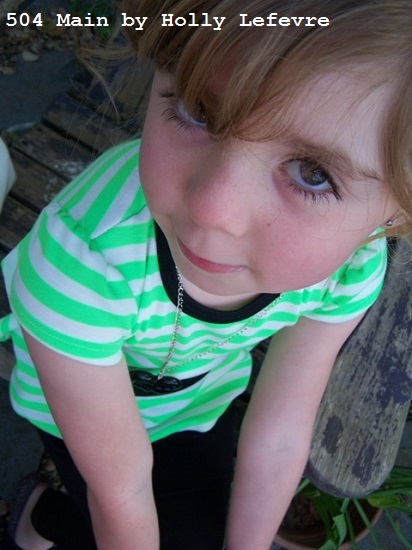 With the prices on at Cookie's Kids, we were able to purchase a few things, including some cute (sparkly) ballet flats! Shopping online, especially when trying to keep a kiddo focused is great. There is no hunting for sizes or colors - our choices are right there! And there were so many choices, including Disney and Hello Kitty! Cookie's Kids has everything so nicely categorized. It was easy to make our way through all of the choices from Girls Dresses to Boys Suits. While, yes, we were shopping for my daughter but I did pop over to take a look at the Boy's Suits for me son. He is extremely hard to shop for (for so many reasons) and I thought I would take the opportunity to see what was available just in case he needs some "fancier attire" for an upcoming event. My son's style is also very conservative, so I find my self shopping School Uniforms for supplement his wardrobe - there is a great selection of basic collared shirts and pants! We do not have to wear uniforms at our school, but after seeing this selection and the prices, I will passing along this information to some of my friends! As we shopped, we used the Alva sizing system to determine what size Jules would need. She is very tall for her age and shopping online always presents a sizing issue, but with this easy system, I plugged in some of her info and we had the size we needed! We selected three dresses and they all fit perfectly. 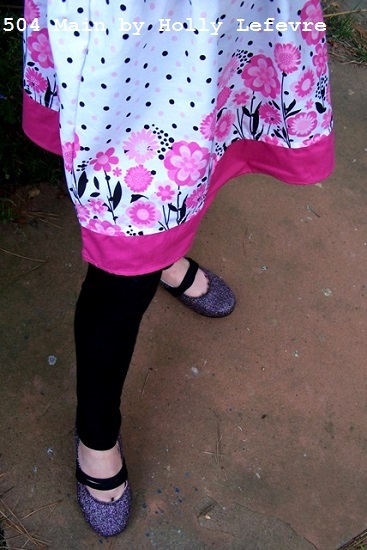 The Petal Pretty dress was maybe a wee bit short, but this girl loves her leggings...under everything...so it works! Cookie's Kids has a great history and is an American success story! 1972, a young man named Cookie and his brother Marvin went into business together. They rented a 1600 square foot store in Jamaica, Queens, fixed it up, bought inventory and Summer and Fall, and opened a day after Thanksgiving with a full stock of holiday toys. The toys were a success and they put the extra money toward buying children's clothing for the next season. When that did well, they bought more clothing. The business was on it's way. By the late 1990's there were six superstores throughout the NYC area, and though they previously had different names, by that time they were all named Cookie's Kids. Also in the late '90s came an important addition to Cookie's Kids' inventory: school uniforms. 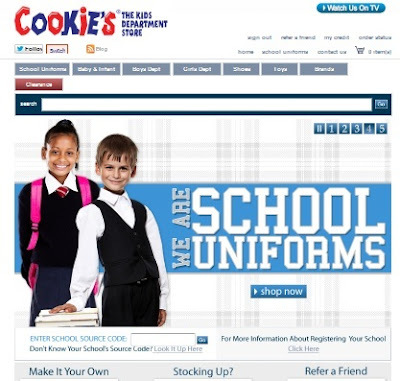 It was the steady success in uniform sales that paved the way for founding CookiesKids.com in 2007, which originally sold uniforms and soon after the entire Cookie's Kids Inventory. 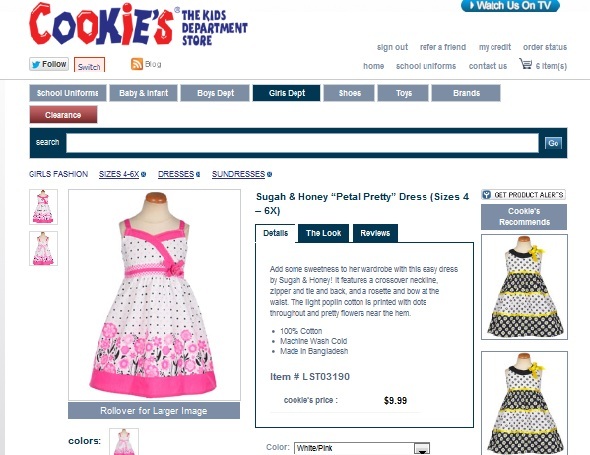 Cookie's Kids now has 7 stores in the NYC area: Bronx, Brooklyn, and Jamaica...and you can shop Cookie's Kids online as well! I was really impressed with the selection of clothing and the prices. My daughter LOVES her new dresses! I may not be able to get it off her. facebook and twitter for updates and specials! Now...I need to do some more shopping! CUTE dresses! I'm going to have to go check that out. 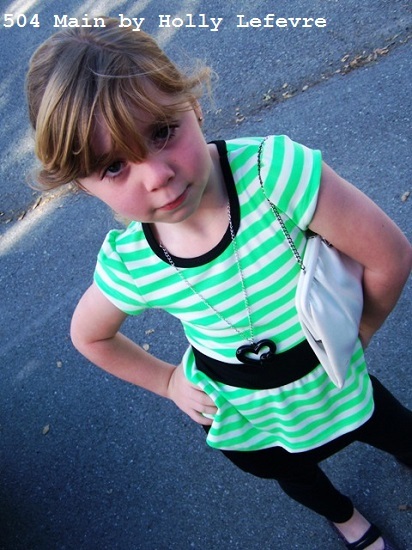 At four years old, my daughter is also quite the fashionista. She pretty much only wants to wear dresses though, which does get old for me. 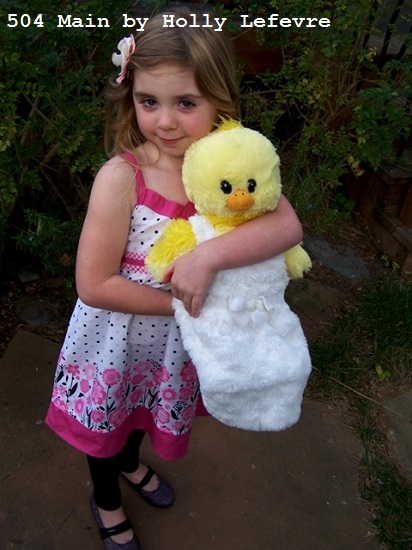 But, Easter is a time to get all fluffy and girly. And we are in need of a dress! Heading over there now. I especially love the 80s get-up! Your daughter is a little princess!!! Adorable and beautiful girl! So cute ... they have a really great selection! So cute! I love the outfits you chose! 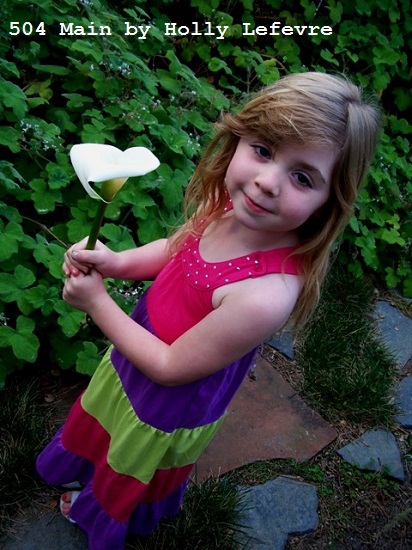 Your daughter is such a cutie, Holly! I love the dress you two picked out! She's adorable...love her facial expressions! 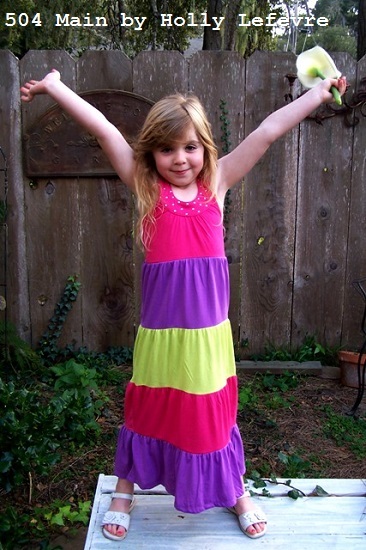 Such cute dresses and an even cuter model! 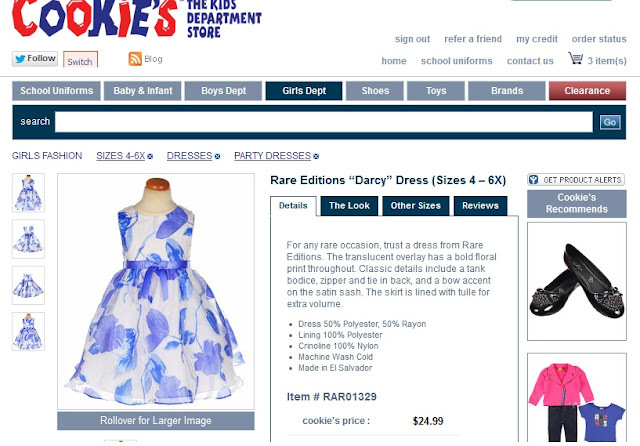 Definitely will have to check out this site as kids dresses are so hard to find unless it is Easter or Christmas. Oh my gosh the cuteness!! I love all the dresses - that maxi is my fave though. And your daughter is just too adorable!! I love that color block maxi, heck I love all of the choices you guys picked! She's adorable! She is so cute! I love all her outfits. My three year old daughter is the same way about clothes.